Merry Christmas! It is officially the holiday season in my world because my special Memory Tree is up and full of ornaments and lights. 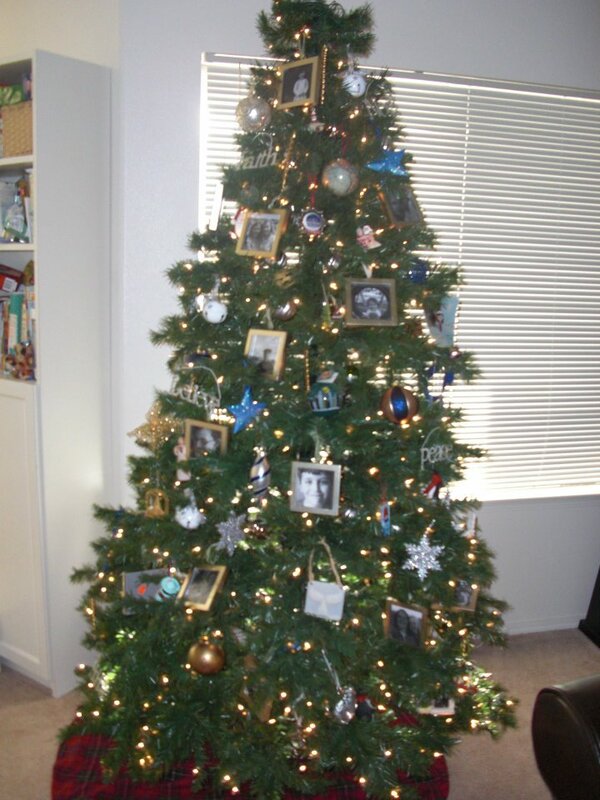 I love my tree because I have tons of ornaments that symbolize different parts of my life. I have ornaments for Maryland, BYU, Hawaii, New York City, Graduate school, Indianapolis ect. This tradition started on my mission when I purchased a set of Indianapolis ornaments featuring the speedway, Christmas tree of lights and the city skyline. After that I realized that ornaments were small and unlike other souvenir chotchkies they don’t hang around all year gathering dust. Its funny because not many people see my tree- especially in a year like this where I probably won’t host a Christmas party in my apartment. Nevertheless, it gives me pleasure and provides many warm memories. Its a way to turn an apartment of one into a holiday filled with love. Some people might think it is a waste of time to put so much work into something enjoyed by only one person but I disagree. I think it is very important as an older single person to establish your own unique traditions all year but especially during the holidays. It helps me to feel a sense of stability and ensures I will have happy things to look forward to each year. I think happiness when you are single requires a little more planning than when you have other people to do the planning for you! I highly recommend it for anyone who is single kids or not- decide what you want in a Christmas and then go out and make it. Don’t feel like anything is too silly to do ‘just for you’. You matter and are worth planning happy memories for. Don’t let yourself get bogged down in self-pity (and Christmas goodies! This year I am doing the sugar fast and so the more I’m out of the house the better!). 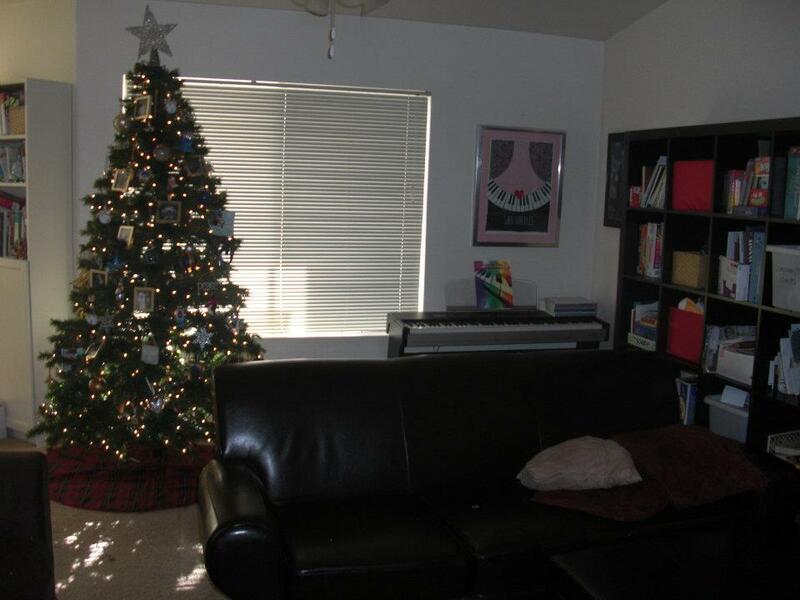 I was worried that with my new sofa I wouldn’t be able to fit the tree and its a cozy main room but I love it! I am so looking forward to this Christmas season. I have lots planned. Tonight I am going to the Messiah Sing-in in American Fork (my 5th year in a row attending), tomorrow is Anna’s choral concert A Celebration of Christmas at BYU, next weekend I have Christmas Carol at Hale Theater (another essential Christmas tradition), and then the Nutcracker on Saturday. On the 17th I am having my Christmas Swimfest! Its going to be fun. Its at the Gene Fullmer pool in West Jordan at 9:30. I have Christmas swim caps and we will swim together. Then after we will go to the Golden Corral for breakfast! Anyone is welcome! On December 20th I have my vocal recital for my voice lessons. Plus, my sister and her family are coming into town sometime. It stands to be a great Christmas season! (and don’t forget scores of Christmas music and movies!). I hope you all have great Decembers and I will keep you posted on mine. Let’s just pray I don’t get sick so nothing will spoil my plans. On a side note, I have a Christmas card I’d like to send out so if you can get me your address I’d be very grateful. Merry Christmas friends! I just started the ornament idea with my husband. We buy an oranament that represents a major event that happened during the year. We are only up to 4, but look forward to many more years of collecting. I love the Christmas season as well. Thanks for the comment. Its fun to have a collection to build up over time- especially one that doesn’t create a lot of clutter. Christmas can be tough when you are in school because finals are at the same time. Take reassurance that there will be a time when you can have more leisurely holiday seasons where you can do more activities.